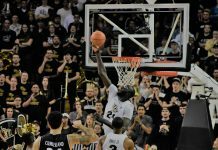 The University of Central Florida’s first game of the 2016 season has yet to be released although the Knights will take to South Florida against FIU late September at 7 p.m.
Conference USA announced the kickoff time of the matchup to take place at 7 p.m. in Miami, with the record currently held at 2-2 between the teams. The 2015 season had the Knights host the Panthers, seeing defeat at only a point away – 14-15. The new coaching staff following the retirement of former UCF football head coach George O’Leary and interim head coach Danny Barrett soon would be led by Oregon’s Scott Frost. Frost cleared the football coaching staff and set in a new team of offensive and defensive coordinators, working along with the UCF Athletics administration to push a different side of UCF football than carried by O’Leary’s traditional approach to handling the team. 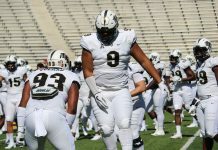 Spring practices had music echo through the field and coaching staff create bets between which practice team, black or gold, would come out on top during the annual spring game. Social media has taken the push for the change in leadership with tags such as #UCFast and #UCFierce building up an ‘exciting’ and ‘fast-paced’ form of play that characterized the University of Oregon while Frost sported a Duck polo. The success of the changes broke a university spring game record by nearly five-fold at 23,147, during which Frost put on the anticipated gameplay promised by the new head coach – a no-huddle and spread offense. 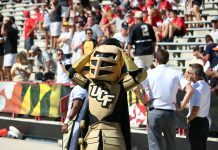 Previous spring game official attendance numbers have not been kept, although UCF Athletics quoted the average in past years to be between four and five thousand.